The first substantive modules in Wile’s Exploring Creation with General Science promises to introduce historical sciences, archeology, geology, and paleontology as a way of introducing “life science.” Wile doesn’t deliver on that promise. Instead, he offers an idiosyncratic method for evaluating historical evidence, which he then applies to the Bible, a critique of methods of dating artifacts, and finally a wildly tendentious claim that the Bible is the best source for studying the history of human life. archeology’s main strength lies in uncovering and clarifying the history of civilizations for which we do have historical records. In Wile’s model, archeology confirms or contradict historical evidence, i.e., documents. But it is only one of the ways documents are evaluated. Wile here introduces three tests that “historical science” applies to any document: the internal test, the external test (the domain of archeology), and the bibliographic test. The internal test looks for internal contradictions. The external test evaluates a document against other historical facts, drawn from other historical documents and archeology. The bibliographic test tries to determine if the document is a faithful copy of an eye-witness account or of a reliable report of an eye-witness account. To illustrate these three tests, Wile applies them to the Bible and finds. He explains away contradictions to ensure that the Bible passes the internal test. He cherrypicks archeological evidence that confirms Biblical passages. Finally, he claims that the text of today’s Bible differs little (and only trivially) from the ancient Old and New Testaments and is, therefore, “faithful to the original eyewitness accounts.” All this leads him “to the scientific conclusion that the stories and account in the Bible are more trustworthy than any of the other accounts we have about the Roman Empire and other facets of ancient life!” We might wonder about Wile’s definition of “scientific” here—his three tests from the “historical sciences” come from an old introduction to English literary history and folklore. many scientists love to use radiometric dating because they want to believe that the earth is billions of years old and that man has been living on earth for hundreds of thousands or even millions of years. It’s fascinating to see Wile whose faith drives his analysis charge scientists of being dogmatic. At a minimum, Wile opens himself to the charge of being blind to his own prejudices. More severely, he reveals his own hypocrisy. Wile’s three tests, his “scientific” analysis of the Bible, and his rejection of radiometric dating all serve his broader point: the Bible is the best source for understanding all human history on the planet. Module #5 is a fascinating example of selective logic, vague definitions, non-sequiturs, and unintentionally funny assertions—such as when Wile writes: “If you start deciding to reject parts of biblical history, you have really departed from the science of history and are more or less making up the rules as you go.” The module’s implicit goal reinforces that of the first two modules: distort uncertainties to undermine scientific techniques in an effort foster doubt in and suspicion of scientific results. I had never heard of these tests before reading Wile’s book, or at least I had never heard of them labeled “internal,” “external,” and “bibliographic.” Wile does not cite any source for these tests. Some digging around reveals that sometime in the 1970s, an popular apologist extracted them from some obscure book published in 1952 by a scholar who worked for the U.S. Air Force. They have become a set piece in reformed Christian apologetics over the last 50 or so years. And now, for a little late summer levity. In an effort to make reviewing manuscripts easier and faster, I put together this little template for the 20-Sided Reviewer’s Die for History of Science. Now, instead of having to read through the entire manuscript, trying to identify and evaluate the argument and sources, you just have to toss a die a few times (see instructions on template). 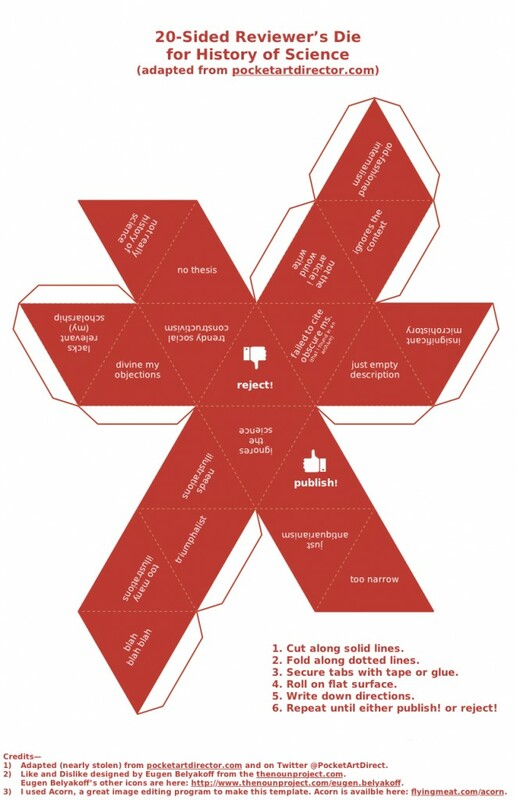 20-Sided Reviewer’s Die for History of Science, with instructions. A pdf version is available as a download if you want to make your own. This post continues the analysis of Jay Wile’s Exploring Creation with General Science by looking at the last two and least contentious of the prefatory or framing modules. After some comments about how scientists come to the wrong conclusion because they rely on flawed experiments, “Module #3: How to Analyze and Interpret Experiments” seems reasonable for a middle-school science class. It introduces various features of experimental science, e.g., experimental variables, control groups, blind experiments. “Module #4: Science, Applied Science, and Technology” revives an out-dated understanding of science and technology. Science is a pure, curiosity driven investigation of nature untainted by worldly concerns. Scientists, who hope to explain “some facet of creation,” do “not care one whit about whether or not the knowledge gained is useful.” Applied science, by contrast, seeks to make something useful or to find a better way of accomplishing some task, either by developing a new process or a new machine. Lowly technology, while similar to applied science, “is often the result of applied science” or science or accident. Wile’s distinction reflects a difference between “knowing why” and “knowing that” something happens and privileges knowing why. It also assumes that “knowing why” is a purely intellectual project motivated by curiosity, unlike applied science and technology, which answer to worldly concerns. Module #4 also includes a vaguely incongruous discussion of simple machines as examples of applied science and technology. Now that we understand what science is and is not as well as its limitations, Wile feels students are prepared to learn about geology and paleontology, “two of the most controversial fields in science.” Modules #5 through #8 promise to cover these controversial fields.